Nutcracker phenomenon refers to compression of the left renal vein, most commonly between the aorta and the superior mesenteric artery, with impaired blood outflow often accompanied by distention of the distal portion of the vein. The nutcracker syndrome (NCS) is the clinical equivalent of nutcracker phenomenon characterized by a complex of symptoms with substantial variations. Depending on specific manifestations, NCS may be encountered by different medical specialists. Although it may be associated with substantial morbidity, the diagnosis of NCS is often difficult and is commonly delayed. Diagnostic and treatment criteria are not well established, and the natural history of NCS is not well understood. We report a new case of Nutcracker Syndrome in a male patient who came to our Hospital with lumbar pain and macroscopic hematuria, the strategy of care and different treatment modalities . Nutcracker Syndrome is the consequence of compression between the superior mesenteric artery and the aorta over the left renal vein [mesoaortic entrapment]. It results in dilation of the vein and the appearance of varicosities in the renal pelvis as well as in the ureteric and gonadal veins. In general terms, variants of the retroperitoneal vasculature are rare, even though, due to current imaging technologies, it is possible to diagnose these abnormalities, which otherwise could remain unnoticed. he is a patient of 59 years with antecedents as pulmonary tuberculosis treated 20 years ago, who consults for intermittent macroscopic hematuria associated with left lumbar pain occasionally radiating to the right flank, which had lasted several months ; no other associated signs . During each episode the patient remained afebrile and hemodynamic ally stable, although on one occasion it was necessary to transfuse two units of packed red cells due to his being anemic. On examination, the patient has a mild left varicocele. Blood tests revealed a low hematocrit and hemoglobin, and proteinuria was found on urinalysis The patient underwent a range of further examination; Ultrasonography and urography did not demonstrate any significant findings, so a CT scan of the abdomen and pelvis was requested to further investigate his hematuria. 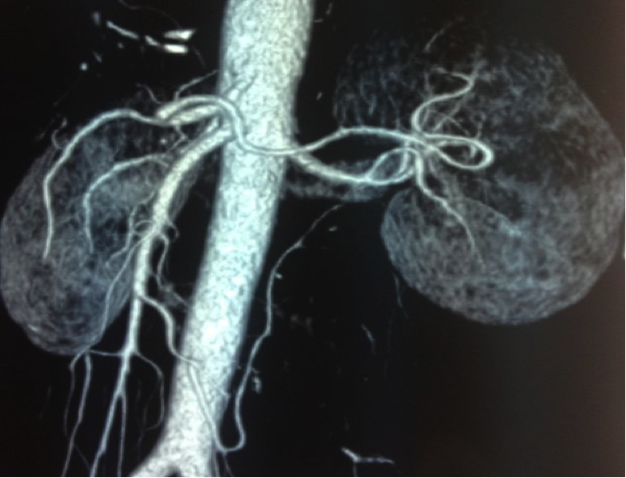 Images revealed that the left renal vein was of large caliber and diagnosis of nutcracker syndrome was confirmed [1, 2]. the patient benefit from surgical treatment [transposition of the renal vein, renal vein bypas] ; Clinical outcome is favorable with disappearance of both pain and hematuria. In 1950, Mina and El-Sadr described a secondary varicocele due to compression by the superior mesenteric artery of the left renal vein, thereby hampering venous return dependent on the left renal vein, resulting in varicose pelvic, ureteral and gonadal veins. Nutcracker syndrome has been classified as: Anterior, if compression is due to the superior mesenteric artery [often associated with renal ptosis or an abnormal origin of the superior mesenteric artery] and Posterior  [or Nutcracker pseudo syndrome] if the compression occurs between the aorta and vertebral bodies, usually caused by the persistence of the posterior branch of fetal peri aortic vascular ring . Epidemiologically, this entity occurs more frequently in women and is diagnosed within the 3rd and 4th decade of life; our case however was in a 59 year-old male. It is difficult to define the exact incidence and prevalence of Nutcracker Syndrome since the majority of patients are asymptomatic, and are diagnosed incidentally on imaging ordered for other reasons. Despite this, our patient suffered lumbar pain and macroscopic hematuria which required a blood transfusion. Overall, when abdominal CT and ultrasound were reviewed, 72% showed compression of the renal vein between aorto-mesenteric clamp, although most patients would be, as already stated, asymptomatic . The typical clinical manifestations include back pain occasionally radiating to the gluteal area and hematuria [macro or microscopic], in few cases, patients develop anemia which may require blood transfusion. Other signs and symptoms may include proteinuria, hypertension, orthostatic hypotension, fatigue and weakness. Physical examination may demonstrate the presence of varicocele in males and pelvic varicose veins in females with symptoms of chronic pelvic pain or dysmenorrhea . Also arteriovenous fistulas associated with Nutcracker Syndrome have been described. Often the diagnosis is reached by exclusion. As with any other condition, assessment begins with the history and exploration. The findings of laboratory results are nonspecific. With regard to imaging studies, it is usual start with an abdominal ultrasound due to its utility, safety and low cost. On ultrasound, the renal pedicle can be seen with a dilated vein and slightly enlarged kidney due to renal congestion. The next step would be a diagnostic CT or MRI. Both could be demonstrate the presence of a greater angulation in the superior mesenteric artery leaving the abdominal aorta, trapping the left renal vein [4, 9]. With regard to more invasive investigations, retrograde venography and video angiography to determine the renocaval pressure gradient will give a precise diagnosis of aorto-mesenteric clamp. Venography will demonstrate the area where the compression is, the existence of collateral circulation in periureteral vessels, reflux into the renal vein branches [adrenal vein and gonadal vein] and the stagnation of contrast in the renal vein. The pressure gradient between the renal vein and cava must be greater than 1 mm Hg to lead to a diagnosis of the Nutcracker syndrome, since the normal value is stated as between 0 and 1, nevertheless in advanced cases of Nutcracker Syndrome, due the development of collateral circulation, the gradient might be normal . After confirming the diagnosis of Nutcracker Syndrome different treatment alternatives can be chosen taking into account the symptoms of each individual patient. In asymptomatic or mildly symptomatic cases, expectant treatment may be an option, even moreso in younger patients where spontaneous resolution might be expected . Amongst conventional open surgery, auto transplantation, transposition of the renal vein, renal vein bypass or renal vein and fixation and medialization through nephropexy could be considered . Using open or laparoscopic surgery, and with good outcome in the short term, an extra vascular prosthesis could be placed [ring-reinforced PTFE]. It will enhance the renal vein and prevent the collapse of the portion between the renal vein and aorto-mesenteric clamp. This technique was described for the first time in 1988 by Barnes. Utilising interventional radiology techniques, endovascular stents can be placed. The medical literature describes good outcomes with endovascular stents, in terms of the disappearance of symptoms, although this technique is not exempt from complications [proximal migration, embolism and thrombosis of the prosthesis]. This technique requires the mandatory prescription of antiplatelet therapy with the risks this entails [7, 8]. Nutcracker Syndrome is a rare entity, and is due to the compression exerted on the left renal vein from the clamp that forms from the superior mesenteric artery and the aorta. The usual clinical presentation is lumbar pain and hematuria. This is most frequent in females among in their fourth decade of life. However, it is more usual for patients to be asymptomatic, and this group do not require treatment. In most cases, common imaging techniques will confirm the diagnosis and it is rarely necessary to undertake invasive techniques such as venography. Usually treatment is minimally invasive, although open techniques are cited in the literature. In asymptomatic patients, especially if they are young, expectant treatment is the best option. Professeur A, janane and Dr. A, Hamdoune recommend publication of this article. El Harrech Y, Jira H, Chafiki J, Ghadouane M, Ameur A, Abbar M. Actitud expectante en el Síndrome del Cascanueces. Act Urol Esp 2009;33(1):93-96. Muller Arteaga C, Martín Martín S, Cortiñas González J R, González Fajardo J A ,Fernández del Busto E. Síndrome del cascanueces posterior: Vena renal retroaórtica asociada a fístula arteriovenosa y carcinoma renal. A propósito de un caso y revisión de la literatura. Act Urol Esp 2009;33(1):101-104. Gutierrez E, Hernández E, Sánchez-Guerrero A, Morales E, Gutiérrez-Solís E, Praga M. Mujer de 29 años con microhematuria persistente y episodios de hematuria macroscópica. NefroPlus 2008; 1(2):33-36. Santos Arrontes D, Salgado Salinas R, Chiva Robles V, Gómez Vicente JM, Fernández González J, Costa Subías J. Síndrome del Cascanueces. A propósito de un caso y revisión de la literatura. Actas Urol Esp. 27 (9): 726-731, 2003. Martínez-Salamanca I, Herranz Amo F, Gordillo Gutierrez I, Díez Cordero JM, Subirá Ríos D. Síndrome Nutcracker o Cascanueces: Demostración mediante TAC helicoidal con reconstrucción 3D. Actas Urol Esp. 28 (7): 549-552, 2004.